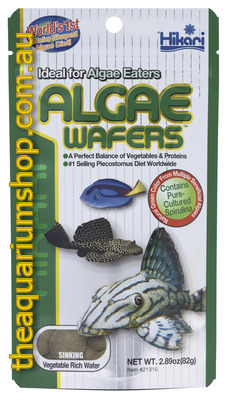 Great for Plecostomus and Algae eaters. The rich and finest diets for algae eaters. Offers complete and balanced nutrition for superior growth and improved health. Contains higher levels of spirulina and vegetable matter Plecostomus and other Algae eaters prefer. The uniquely shaped disc won't dissolve readily or cloud aquarium water. The "original algae wafer"-Easy and convenient to use. Rich in necessary vitamins and nutrients,including stabilized vitamin C to reduce stress and stress related disease.